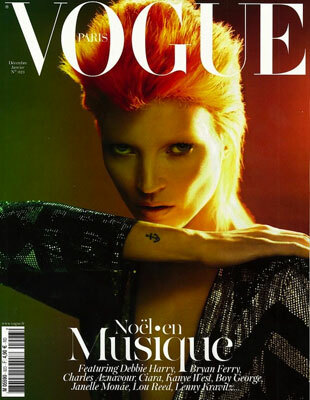 Kate Moss as David Bowie on the cover of French Vogue.. is there anything this woman cannot pull off? Not many woman, or men for that matter, can rock the hell out of an orange mullet and still manage to make it look high fashion and current. Having already channeled the Alladin Sane album cover for British Vogue a few years back, obviously it stands to reason that one step further should be taken: enter ginger wig. Emmanuelle Alt sure knows how to get a girls taste buds tingling with the visual splendour this cover has produced. C'est magnifique!